The horrors of World War II upended Western civilization. War ravaged nations. Governments attacked their own citizens. Neighbors lost trust in one another. Between secret police and state propaganda, the fighting extended from the battlefield to the town square as control of speech and thought intersected with the war effort. While vilifying enemies is a normal aspect of war, the citizenry also turned on itself: Germans and French aiding in their neighbors’ deportations to concentration camps, the internment of Japanese-Americans, and the similar British internment of German and Austrian citizens represent the heights of public paranoia and scapegoating. The uneasy atmosphere unavoidably influenced the popular culture of the time. Some of it was overt, like anti-Japanese and -German hysteria in early Bugs Bunny cartoons or dystopian fiction such as George Orwell’s Nineteen Eighty-Four, while other works borrowed only the general feelings of fear and paranoia, like George Cukor’s film Gaslight from 1944. 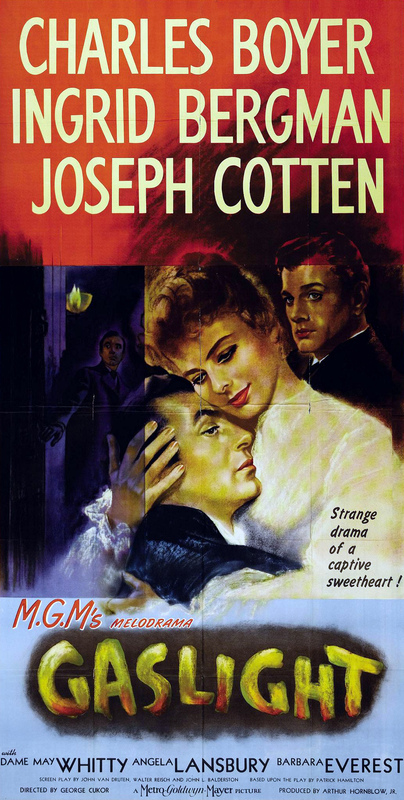 Cukor’s movie is adapted from a 1938 British play by Patrick Hamilton and preceded by a British film adaptation from 1940. Hamilton’s play and the British film, directed by Thorold Dickinson, were titled “Angel Street” when they originally reached American shores. Getting these details right matters, because this story is about memory and perception. Today’s audiences may have heard the term “gaslighting” before (particularly in this fractious political season of unrepentant Trumpian falsehoods), and may rest assured that this is from where the phrase is derived. When Gregory nearly drove his young wife Paula to insanity by isolating her and manipulating her environment, he perpetrated an unforgettable trauma in the memory of film and culture. Indeed, he was going beyond the call of his contemporaries to police thought, and taking it one step further by performing what may be film’s first psychological inception (sorry, Chris Nolan). One wonders if anyone at MGM had seen or read the story their production company purchased. If they had, and possessed any sense of irony, perhaps they would have reconsidered their demand to destroy all copies as well as the negative of Dickinson’s film. In true Orwellian fashion, MGM attempted to control the present by eliminating the past: down the memory hole with the 1940 movie. May no one ever compare the two films, nor even remember the original! MGM wanted to treat the moviegoing public like Paula, restricting its access to the world, lying to its face, and forcing it to doubt its own powers of recollection. Later, MGM would again attempt to manipulate the public’s perception of its environment by suing Jack Benny for parodying Gaslight on a 1959 episode of his TV program. Fortunately, MGM eventually dropped the suit. They also failed to strike the original film from existence. MGM did not turn out to be a very powerful authoritarian in this case. But what does their repressive behavior say about their confidence in Cukor’s creation? They should have placed their faith in the artists they worked with, and given the final product’s superb acting, Oscar-winning set dressing, and claustrophobic use of light and sound, they’d have been vindicated for doing so. Instead, MGM gave into the fear of shame that all bullies and dictators hold within: They have to persecute someone, before their own perceived faults are exposed. On the other side of the negotiation, one wonders about the Limey suits who agreed to sell out Dickinson and all the effort it took to create the first film. Why be in the film industry if not for love of film? How did Dickinson react to the terms, and who told him the news? Maybe he took MGM’s worry about their inferiority as a compliment to his craftsmanship. Perhaps he wasn’t too perturbed, knowing that he would create a single secret copy so that the film might live on (and live on it does, in comparative film essays and for occasional broadcast on Turner Classic Movies). For in the end, what does repression and bullying accomplish? In trying to hold onto power, the persecutor turns his victims into willful champions of the self. When an individual is targeted for genocide, mere survival itself is victory. By making their position one of all-or-nothing eradication, MGM ensured their failure when Dickinson was able to hold onto one hidden copy. They also secured their place as the villain in their own behind-the-scenes production story, practically taking cues from the reprehensible Gregory himself.